Yesterday morning I awoke to the worst kind of weather, a couple inches of wet snow overnight followed by pouring rain all day long. It was a slushy mess. The ground is still covered with a few inches of snow leftover from the blizzard a few weeks ago, despite plenty of above freezing days since then. The seeds have been organized, charts and plans have been made, and the onion seedlings are coming along nicely, but it’s going to be a while before I’m able to dig in the garden. Back in January when we had a bit of a thaw I cleaned out one of the cold frames a bit and sprinkled some spinach and lettuce seeds around. I think at that point I thought that spring was right around the corner. Around this time last year I was already starting to prepare the garden beds for spring. Its amazing how quickly I forgot what a real winter is like around here. Despite all the snow and ice on the ground, this past weekend when I went by the garden I discovered lots of tiny lettuce and spinach seedlings growing in the cold frame. With any luck we’ll be enjoying a salad from the garden in a few weeks, even if I can’t plant my peas yet. Any signs of spring yet where you are? Or is your garden still buried in snow? Posted on February 28, 2013 by kate. 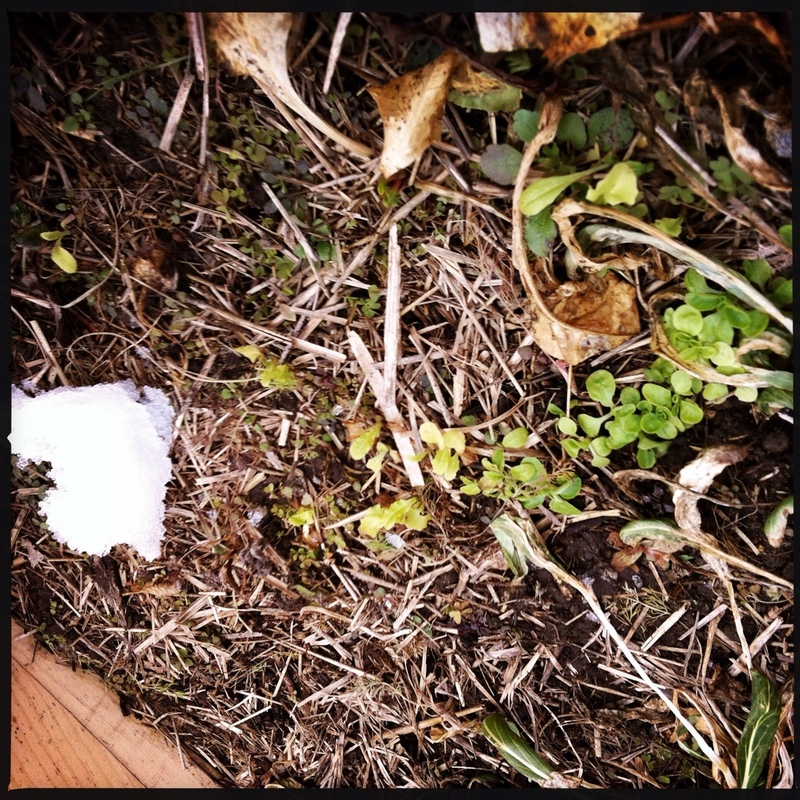 This entry was posted in Gardening and tagged cold frame, February, gardening, lettuce, seedlings, snow, spinach, spring, winter. Bookmark the permalink. Ditto for your friends a little north. I think that cold frame looks delicious — no wonder those seedlings are braving the weather. Thanks! Yes, it’s a tropical paradise inside the cold frame compared to outside! Thanks Claire! I think you’re right. I can’t wait to start digging! Good for you. We have little plants all over the house right now under grow lights. Tomato seeds started during the third week in February to coincide with the 2nd quarter of the moon. My husband swears by the moon cycles and planting schedules. Interesting! I’ve heard of gardening according to the cycles of the moon but I don’t know much about it. I’ll have to look in to it. He uses Llewyln’s Moon Sign book, which gives planting advice. He’s been gardening for 40 years so I believe whatever he tells me! 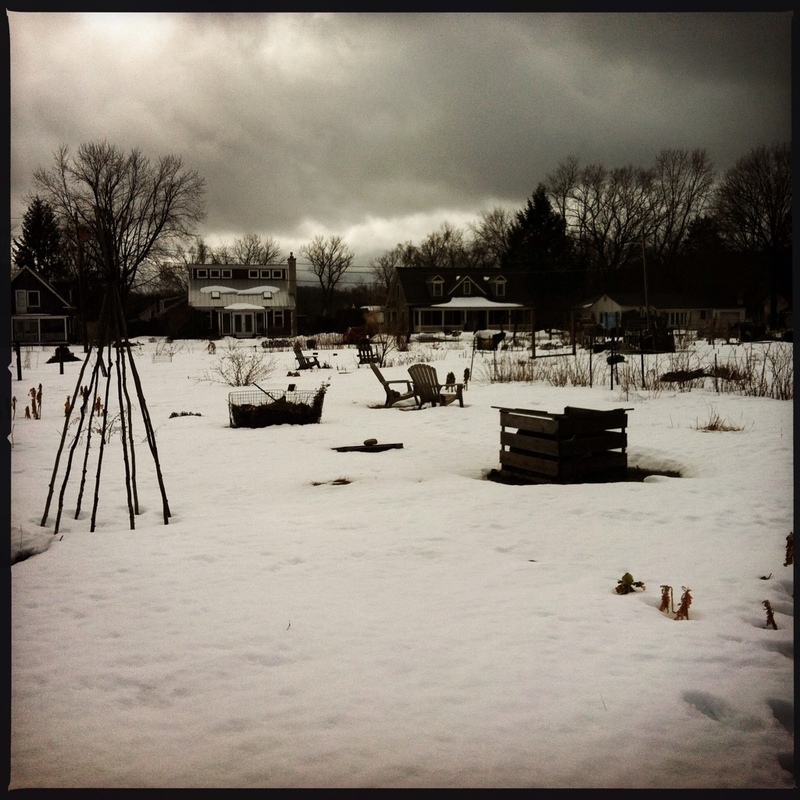 My garden is much like yours – a sodden snow covered mess. But just started the tomatoes and hot peppers indoors and have some greens planted in old orange crates flourishing under the grow lights. It makes me hopeful to hear about your spinach and lettuce. Bring on the thaw! I love that top photo – it’s just overflowing with the most wonderful mood. We just got dumped on with huge amounts of wet, wet snow, so spring has been pushed off a bit here! Thanks! I thought it captured the gloomy mood pretty well. I guess we got lucky here– that last big storm that came through was mostly rain here. Fingers crossed that that’s the last of the snow! Our garden is still under feet of snow in Maine. We probably won’t even be able to get to our property until late April. Here at our home in New Hampshire we have piles of plowed snow blocking the garden gate. I’m eagerly awaiting the spring warmth. I was going through last years’ garden photos yesterday…One year ago this week, I was planting peas. Our snow cover may be gone, but it’ll be the end of the month at the earliest before it dries out enough to dig. On the bright side, there are some garlic poking up in the upper garden! Tough winter but your photo of it is excellent. The sky lighting is beautiful. We were spoilt by last year’s unusually warm winter. Right now, most of my garden is snow free (except for mounds of snow here and there) hopefully it will dry out a bit so I can get in and do some cleaning up and digging. We;’ve had some balmy Spring sunshine in the UK – it was so welcome. The snowdrops are all out and I’ve bought veggie seeds in anticipation.